A nice one owner find with only 3,000 miles on the clock. It has been garage kept and is bone stock, from the the looks of it. KZr congratulates! 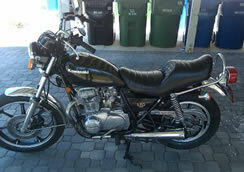 This is luger's 1979 KZ 1000 B3. Nice & clean example of the LTD, with a few minor mods like the Z1 tank and the Kerker pipe. You can see a better picture and some member comments in the gallery. This is motohead's 1979 KZ 750 B4. The owner says he'd like to put pods on it and move the battery, but still looking for jets. Paint is Duplicolor laquer rattle cans. You can see a better picture and some member comments in the gallery. This is kzkelly's 1976 KZ 900 B1. The owner didn't leave any description, but who needs one when your bike looks like this. You can see a better picture and some member comments in the gallery. This is aacoop's 1980 KZ 650 F1. Another '80 650 for BOTM. The owner's only comment is "It's a doll"... You can see a better picture and some member comments in the gallery.